It is definitely a work-in-progress. Although all the mechanics are in place, not all of the fancy stuff is. Specifically Visions and Blessings. 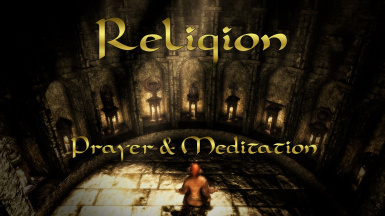 The boons for Meditation and the Divines are complete, as well as Azura, Boethiah, and Clavicus. The visions for Meditation and Divines are mostly finished, although Stendarr, Talos, and Zenithar are still missing a few. I'll try updating it procedurally, but I've reached a bit of a writer's block with the visions, and just wanted to get something out. I'll probably be shelving it for a short time while I update a few of my other mods that I've been neglecting, and possibly start porting over a few of them to Special Edition. Beyond overhauling the scripting techniques, the way I've built up the different Deities is the main focus of this update. I've tried incredibly hard to give each Divine, Daedra, and Spirit their own personality and theme when it comes to how they interact with the player. 'Spirits' are a new group of miscellaneous yet still somewhat influential Deities, that a lot of people have asked about, that I will be including, like Sithis, the All-Maker, Y'ffre, Magnus and potentially a few others. Unfortunately, the lore on these guys is nearly nonexistent. They each have about a paragraph or two on the UESP, and that's about it, so they likely won't have as complex a system as the Divines or Daedra. I'm also going to be adding in a lot of info-based systems; loading screens, in-game books, and visions that will hopefully alleviate the "This guy is angry at me and I have no idea why!" problems. I will be extra-clear here; this won't be a simple stats screen, or simple instructions. Easy power-mongering and the like is not and has never been what this mod is about, it is first and fore-most a role-play mod. You will have to interpret some stuff, but hopefully it will be easy enough for most to figure out. I might post some of these hints to get your opinions on them and see if they make sense. If anybody feels like they cannot wait for it to be ported over to SSE, reply or PM me and I will provide a temporary one until the official is released. I would love to have this for SSE, should go nicely with Patron Gods of Skyrim (I hope, as long as it doesn't conflict!). Thanks!! You can't just repackage the ESP. The scripts have to be repackaged, and there's really not a good tool to do that, especially when we don't have the source. I'm doing an honourable samurai playthrough and this mod is ESSENTIAL. I'd love an SSE copy! I'm so excited to try this mod, thanks so much! can i have one please? Can I please have a copy? Hey could you send it to me too please? Would appreciate it. Oh, I would love to have the SSE version! I loved this mod on oldrim and I'm definitely missing it now that I'm using SSE. If you're still doing this, I'd love a copy. I too would love a copy if you're still distributing it. I would love to have it please, if you're still distributing it. If not I understand. omg I love you, could u do that, Ive been waiting for years to play this on sse I cant wait a second longer. mary me. Is the offer still up? What I need to do for Julianos? Is there any manual with details somewhre? Can you add Manimarco god of worms for my necromancer please? The king of worms died in oblivion. Manimarco has died a handful of times. He's basically the necromancy god though so I don't exactly see that being a reason for being unable to worship him. Nice mod, but I would love to have those animations that Brodual had in his video. I tried the immersive animations mod but it doesn't add those praying animations. If I do the prayer shout I will do an animation, however there aren't any directed for the shrine prayer. How can I get an animation for it? Thanks. My daedric lord is uncertain about me how do I fix this ? 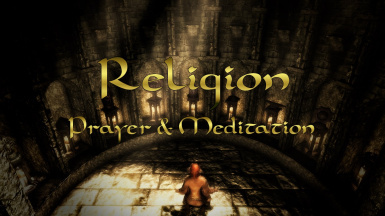 Not sure how much more religion you can add to a game that's literally all about religion. I love the roleplay possibilities with this mod but apparently I angered Kynareth and the punishment is a stamina regen curse. How much slower is your stamina regen? TWO HUNDRED FIFTY % SLOWER! What the hell is that? I don't even know how I angered Kynareth (Maybe killing wildlife? Or killing Spriggans? I killed some bears and spriggans on the way to Helgen). I might uninstall the mod just because of that. I can't be adventuring with basically negative stamina regen. I have a problem, the animations are not working. When i pray or meditate my character just put his hads together and face down like he has his hads tied like a prisoner. I already have installed dovahkiin can relax too and animations at skyrim, it does not fix it. I already used Loot to fix the load order, and Tes3dit does not find any problem. This may be a dumb question but did you FNIS again after installing this and the others? My understanding is you should be running FNIS if ever you have run it after installing any new animations, and should run it after installing any custom animations period. Help! How can i kneel while Meditating? Can you tell us the name of the mod or give us a link?